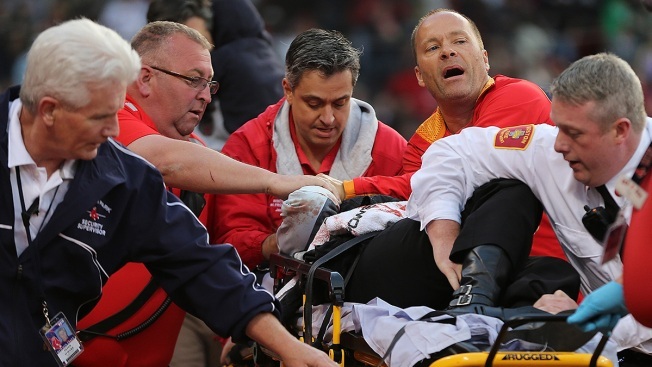 A fan is attended to by medical staff after she was hit by a broken bat during a game between the Boston Red Sox and the Oakland Athletics in the second inning at Fenway Park on June 5, 2015 in Boston, Massachusetts. A woman suffered life-threatening injuries after being struck by a broken bat at Fenway Park Friday evening. The game between the Red Sox and the Oakland Athletics was delayed while paramedics tended to the patient, according to Comcast SportsNet New England web editor and reporter Jimmy Toscano. She was rushed out of the stands on a stretcher. The patient was transported to Beth Israel Deaconess Medical Center. "It's a scary moment," said manager John Farrell. "An accident like this tonight is certainly disturbing. And like I said, our thoughts and concerns are with her and her family." A's third baseman Brett Lawrie was batting against Boston starter Wade Miley when the bat splintered, sending the piece of wood into the stands. Right fielder Shane Victorino tweeted a note of sympathy. Hope the woman injured at Fenway tonight is doing ok. Tough to see. Thoughts and prayers with her and her entire family. Fans were understandably shocked by the accident. "Security guard came down to us and told us exactly what happened - that she got cut in the face, and she had to get rushed to the hospital, they had to bring a team in to clean up the blood that was there," said Rich Penta of Norwood. "We just saw someone coming out on a stretcher, and it was very upsetting," said Lauren Levine of Needham. "It was really scary." "You don't think about the danger that you could possibly be in when you're sitting at the game at Fenway," said Emily Hardman of Brookline. Some fans told necn there appeared to be a child with the woman who was whisked out of the park with her. The patient's name was not immediately released. There has been no further word on her condition.